We are your resource for high-quality credit card swipe readers, priced competitively and usually available to ship the same day. Our mag stripe/swipe readers are capable of reading tracks 1, 2, 3, and EMV while being offered in a variety of connection types, including Serial/RS-232 and USB. Need mag strip writers we carry those as well! Depending on your business you may need a countertop reader or a mobile reader. We carry the top credit card reader brands, such as Magtek and ID Tech, as well as payment terminals from top brands Ingenico, Equinox, and VeriFone. . No matter your business restaurant, retail, or grocery we have you covered with a credit card reader that you need. To learn more about what products are right for your situation, check out the credit card swipe readers we have at Barcode Discount below. Omni Barcode Reader, USB, Black, Keyboard Emulation, Reads Barcodes only, Infrared. Includes USB cable. SureSwipe, USB, Dual Head, Keyboard Emulation, Reads Tracks 1, 2 and 3. Includes USB cable. Color: Black. Dynamag, USB, Black, Keyboard Emulation, MagneSafe 2.0, Reads tracks 1,2, and 3. Includes USB cable. Non-encrypted. Shuttle, Mobile Reader, Apple iPhone/Apple iPad/Apple iPod/Android compatible, Green, Reads tracks 1 & 2. This device requires encryption and is not plug-and-play, please call before purchasing. MiniMag 2, USB - Keyboard Emulation - Tracks 1/2 - Black. MiniMag 2, USB, Black, Keyboard Emulation, Reads tracks 1, 2, & 3. Includes USB cable. SureSwipe, USB, Dual Head, HID (Requires HID Driver), Reads tracks 1, 2 and 3. Includes USB cable. Color: Black. Dynamag, USB, Black, MAGNESAFE 2.0 HID, Reads tracks 1, 2, and 3. Includes USB cable. NOTE: TYPICALLY REQUIRES PRE-ENCRYPTION OF KEY PROVIDED BY THE END-USER. Cash drawers are often one of the most missed, but necessary, components of a POS System. Barcode Discount can configure a cash drawer to meet you currency, size, color, and cash/coin till requirements. Our cash drawers can come equipped with a key or lock for maximum security. Most cash drawers require compatibility with a receipt printer. Our cash boxes can be Manual, or connect via USB or Serial to ensure that they work with your POS Software and Hardware. Take a look at the range of electronic and manual cash drawers we carry at Barcode Discount below, along with our new iPad Cash Drawer! 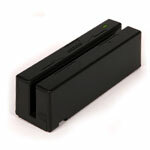 Barcode Discount offers a range of receipt printers for all businesses and applications. We can provide mobile receipts printers for workers on-the-go, stationary or desktop receipt printers for the point of sale counter or kiosk printers for those who want to provide customers with a self-service experience. We offer specialty receipt printers for Quickbooks and Kitchens and can provide receipt printers for any type of connection, including USB, Serial, Ethernet, and Bluetooth. Call one of our experts for more information or choose a receipt printer from one of our top brands like Star, Epson, Zebra, NCR, Citizen and more, in various sizes and at various price points.